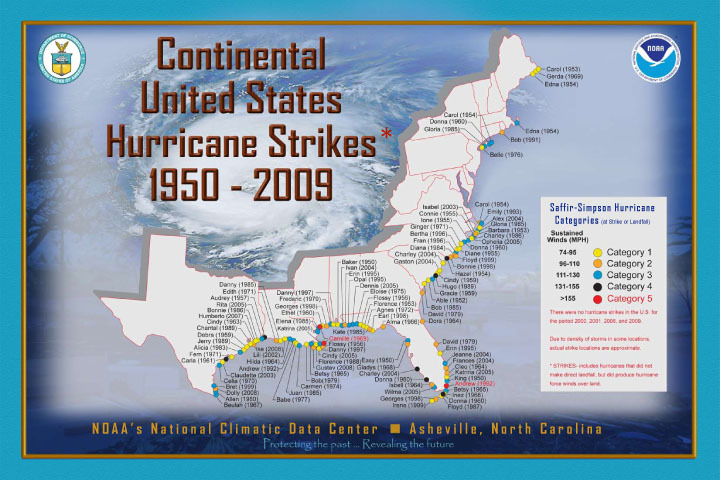 The Continental U.S. Hurricane Strikes Poster is our most popular poster which is updated annually. The poster includes all hurricanes that affected the U.S. since 1950 with hurricane force winds, although some did not necessarily make landfall. This 32x34 glossy poster will give you a quick look of the location and strength of each hurricane which struck the continental Unites States. The map includes the name, category strength, year, and approximate strike location of each hurricane. Preview the most recently available hurricane poster. Purpose To provide high quality posters for significant hurricane events for the public. Lineage Statement Composite poster of hurricane images archived at NOAA.